On September 18, 1907, Arthur Conan Doyle married for the second time, wedding Jean Elizabeth Leckie. From September 21 through November 14, Conan Doyle and his new wife spent their honeymoon on the continent visiting Paris, Berlin, Dresden, Venice, Rome, and Naples. From Naples, they boarded a boat and cruised the Mediterranean Sea with port of calls in Athens, Smyrna and Constantinople. While in the country of Turkey, Doyle was invited to meet with that country’s Sultan, Abdülhamid II, who was a huge fan of the Sherlock Holmes stories. 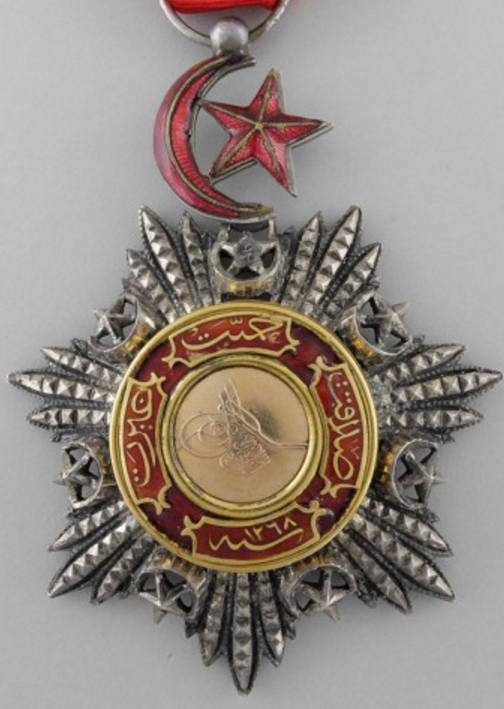 The Sultan presented Doyle with the Order of the Medjidieh of the second class. The Sultan also honored Lady Doyle with the Order of the Chefakat, which was handed by the Sultan to Sir Arthur. Seven-pointed star in silver, with a gold central medallion, around which is a red enameled band bearing four plaques with the words “Zeal, Devotion, Loyalty” and the year AH 1268 (1852) on the bottom plaque. Between each ray of the star are small crescents and stars. The badges of the order are suspended from a red enameled crescent and star device. The ribbon is bright red with narrow green stripes inset from each edge. 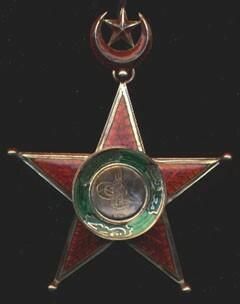 A five pointed star in gold, red enameled, with ball finials and a central medallion in gold bearing the tughra of Abdulhamid II. Around the central medallion is a green enameled band with the words “Humanity, Assistance, Patriotism”. The badge is suspended from a small red enameled crescent and star. A white ribbon with green/red/green stripes toward the edges. 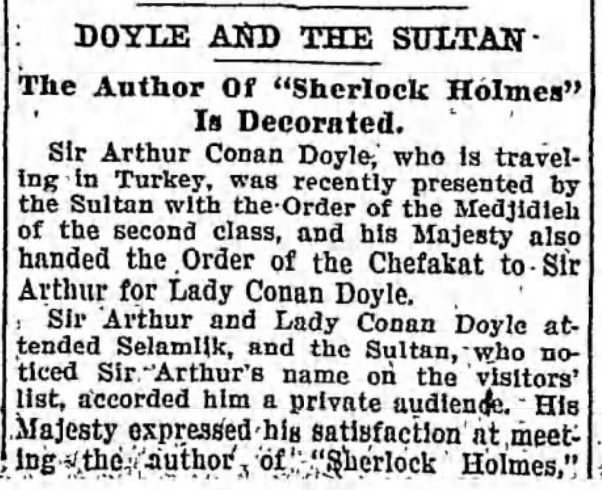 For those interested in learning more about Conan Doyle’s visit with the Sultan, feel free to check out this article, courtesy of Peter E. Blau, the 13th Garrideb.